This children's show featured Popeye cartoons and Three Stooges shorts. 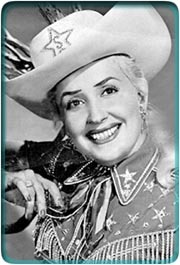 Sadly, Poor Ms. Sally Starr left us this past January, 2013. I recall moving from the NY metro area to South Jersey, specificaly Manahawkin,NJ. @1967 and hearing everyone talk about the big "STAR" that lived in town. Well , that star was nonother than Sally Star. I have to admit it was a bit of "culture shock" compaired to the TV programing at the time in the NJ / NY metro region . Allthough I look back fondly on it now,over 40 years later. Dear old Sally Starr is still recognized around the Delaware Valley. I found a couple bits on Youtube with her--a birthday party IIRC. She appears at public events, openings and probably still goes to the Cowtown Rodeo in South Jersey. Back when we were both younger and cuter (I was four) she gave me a kiss at one of her public appearances. She has said she relates well to children and animals because both can understand when a person means well toward them.